Prof. Dr. Reinhard Kolke, ADAC Director Test and Technical Affairs, thanks FIA President Jean Todt for the promotion of the rescue sheet in Europe. Every second counts when human life is at stake. 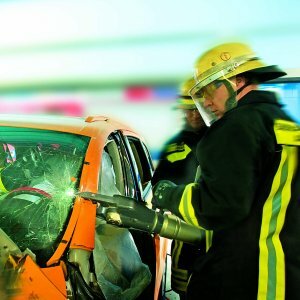 Too often, valuable time is lost in the process of rescuing crash victims entrapped in their vehicles, especially after severe road accidents. The increasingly safety design of vehicles presents rescuers with a serious challenge. In particular, removing car roofs is becoming more and more problematic. Faced with high-strength steel and body reinforcements, even the most powerful cutters reach their limits. Safety components, such as gas generators for curtain airbags, can be a safety risk for emergency response teams. Another problem is how to find and disconnect the battery in modern cars. 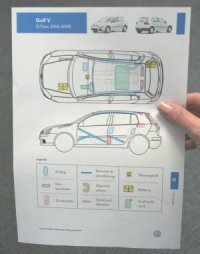 Therefore, a standardised A4 "rescue sheet" including information on the location of cabin reinforcements, tank, the battery, airbags, gas generators, control units etc. - and indicating adequate cutting points must be used throughout Europe. We are pleased to see that manufacturers and importers have made such rescue sheets available on the Internet. This information must be provided throughout Europe. To be readily accessible by rescuers, the rescue sheet must be placed behind the driver's sun visor of each car.